To improve treatment and our understanding of one of the deadliest cancers in the United States, UNC Lineberger’s Jen Jen Yeh, MD, was involved in two studies that take different approaches to precision medicine for pancreatic cancer. Jen Jen Yeh, MD, is a UNC Lineberger member, a professor in the UNC School of Medicine Division of Surgical Oncology and the vice chair for research in the Department of Surgery. 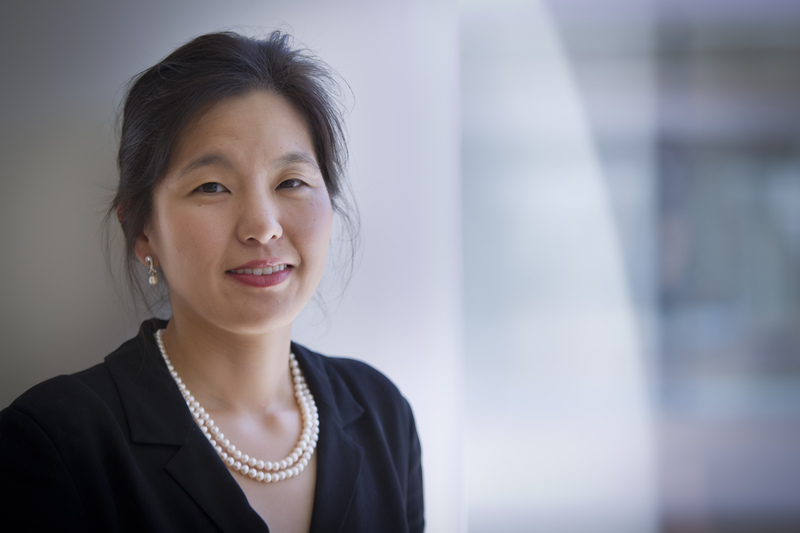 University of North Carolina Lineberger Comprehensive Cancer Center’s Jen Jen Yeh, MD, is working to understand the complicated relationship between one of the deadliest cancers and the web of connective tissue that can surround the tumors. In a new study, Yeh helped uncover findings about the role of the matrix of tissue called “stroma” in pancreatic cancer, and in another, she helped identify the role of molecular tumor subtypes in therapy response. Pancreatic cancer’s five year survival rate is 8 percent in the United States, and researchers hope to improve that. One of the challenges in treating pancreatic cancer is that while stroma can block treatment from reaching the tumor, Yeh said it may also prevent the tumor from spreading. “As many elegant studies have found, stroma in pancreatic cancer is a double-edged sword – it can be both protective and promoting,” said Yeh, who is a UNC Lineberger member, a professor in the UNC School of Medicine Division of Surgical Oncology and the vice chair for research in the Department of Surgery. In a study in JCO Precision Oncology that Yeh co-led with Eric A. Collisson, MD, at the University of California, San Francisco, the researchers analyzed levels of stroma surrounding pancreatic cancer tumors, and in distant metastatic sites. They found the primary tumors had a significantly higher stromal density than the cancer that had spread to solid organs. In addition, patients with a higher stromal density in their primary tumors had longer survival than other patients, a finding that can be analyzed using non-invasive methods, such as a CT scan. Since they discovered that stroma is important to survival, Yeh said their findings suggest that physicians need to think before taking away the stroma on patients for whom their stroma is protective. That makes detecting stroma density at the outset particularly important. In a previous foundational study, Yeh characterized the biologic patterns in pancreatic cancer tumors and in stroma. She found that patients can have different biological or molecular types of tumors as well as stroma, and that both types are linked to outcomes. In a separate, recent Clinical Cancer Research study she co-authored, Yeh and colleagues, including those from the Princess Margaret Cancer Centre in Ontario, Canada, found that patients with one subtype of pancreatic tumors were more responsive to treatment than were patients with a different subtype. “These studies emphasize the potential importance of individualizing therapies for specific tumor characteristics, and the need to develop ways to identify these characteristics with either biopsies or noninvasive imaging approaches,” Yeh said. In addition to Yeh and Collisson, other authors on the first study were Robert J. Torphy, a former medical student at the University of North Carolina School of Medicine, and now of the University of Colorado in Aurora; Zhen Wang, Aisha True-Yasaki, and Benjamin Yeh of UCSF, Keith E. Volmar of Rex Healthcare, and Naim Rashid of UNC-Chapel Hill, Julia Johansen of the University of Copenhagen, and Michael A. Hollingsworth of the University of Nebraska. Other authors on the second study included K.L. Aung, A. Dodd, S. Creighton, S. Moura, and M.J. Moore of the Princess Margaret Cancer Centre; S.E. Fischer, B. Southwood, S.B. Liang, D. Chadwick, G.M. O’Kane, H.A.A. Albaba, and S. Ghai, of the University Health Network; G.H. Jang, A. Zhang, R.C. Grant, A.A. Connor, and F. Notta, of the PanCuRx Translational Research Institute; R.E. Denroche, J.K. Miller, F. Mbabaali, D. Pasternack, I.M. Lungu, J.M.S. Bartlett, M. Lemire, L. Timms, P.M. Krzyzanowski, and J.M. Wilson of the Ontario Institute for Cancer Research; S. Holter and S. Gallinger of Mount Sinai Hospital; R.A. Moffitt, a former postdoctoral fellow at UNC Lineberger and now of Stony Brook University; N.C. Dhani, D.W. Hedley, and J.J. Knox of Princess Margaret Hospital. The study on pancreatic stroma density was funded by the National Institutes of Health, the University Cancer Research Fund, the University of California, San Francisco Resource Allocation Program Funding, and the Doris Duke Charitable Foundation. The study led from the Princess Margaret Cancer Centre was conducted with support from the National Institutes of Health and the Ontario Institute for Cancer Research (PanCuRx Translational Research Initiative through funding from the Government of Ontario.